I don't generally see Journal articles about Web sites. But this Web site may be of interest to those of you who are busily copying your old vinyl recordings onto CDs, and to those of you who — like me — are interested in purchasing CDs of music that is difficult to find. I ran across it quite by accident, have been very pleased with my purchases, and believe other Pi members may find it useful. I myself decided long ago not to bother converting vinyl records to CDs. Many of my favorite records had been re-issued as CDs and I had already replaced them; and since I still have a player for vinyl records, I decided to use my turntable when I want to listen to records I have not replaced. ArkivMusic has access to all the normal sources of recorded music, but — and this is important — it also has acquired a very large collection of old recordings and the right to reproduce them. Some of the best sellers they apparently reproduce in quantity, but many of the recordings they reproduce to order. They can do this very quickly, and the CDs I have received are of very high quality. The prices are about the same as regular music CDs. 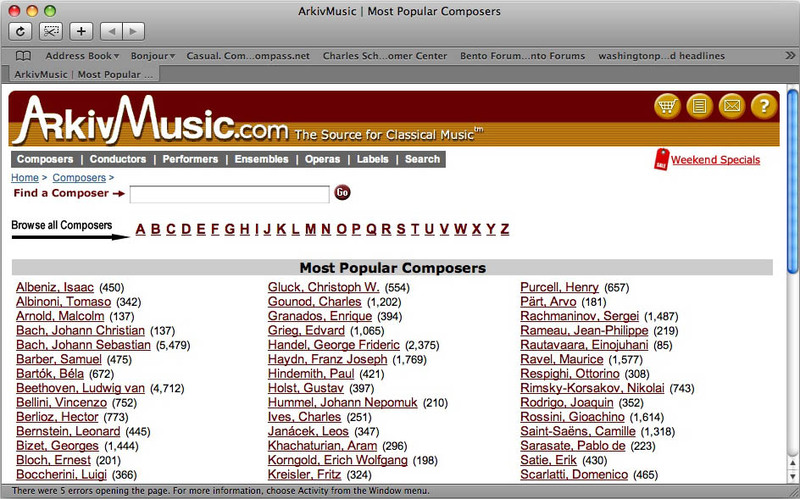 When you click on "Composer" on the ArkivMusic home page, you are transported to this page. 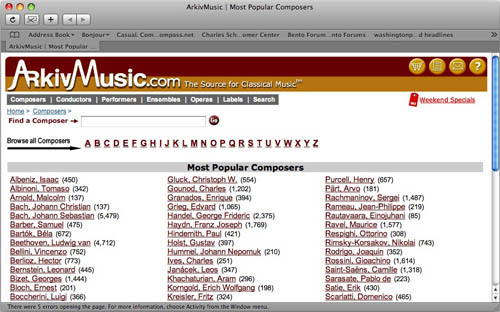 Here you can type in the name of the composer you are looking for, browse all the available composers alphabetically, or skim the list of most popular composers displayed on the page. I recently found and purchased an old Rachmaninov recording I had been lusting after. My experience illustrates both the breadth of ArkivMusic's stock and the ease of using their Web site. A particular interest of mine is the music of Nicolo Paganini (1782-1840), who is generally considered the greatest violinist of all time. Numerous composers —Listz, Brahms, and even Andrew Lloyd-Weber — have written “Variations on a Theme by Paganini,” usually based on the last of his 24 Caprices for Solo Violin, and I have for several years been collecting examples of these variations. A favorite of mine is Rachmaninov’s version called “Rhapsody on a Theme by Paganini.” This is a piece for piano and orchestra, consisting of 24 variations on Paganini's 24th Caprice. Twenty-three of the variations fairly screamed their Paganini provenance. One, however — the 18th — was longer than the rest, was quite a lovely melody, and has become quite well-known as a single piece. However, critics pointed out that it had no discernable resemblance to the Paganini music. Rachmaninov turned the Paganini music upsidedown and played it that way, proving that this variation was indeed based on the Paganini theme. Once you find the CD you are looking for, if you click on the title you will pull up a page that gives you all the details of the CD you could possibly want, including what is on each track and the date that track was recorded. I knew from one of my books that in 1934 (the year it was written) Rachmaninov himself had recorded the work with the Philadelphia Orchestra conducted by Leopold Stokowski. It was that recording that I was looking for. 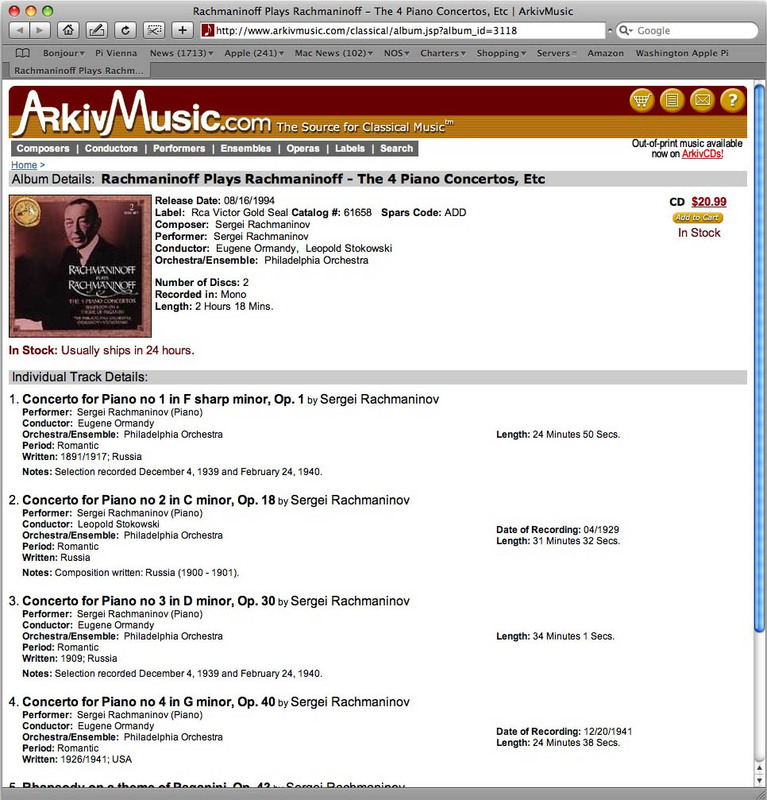 I opened the Web page www.ArkivMusic.com and clicked on “Composer.” (The numbers in parentheses after each composer's name represent the number of recordings the site has for that composer.) Then I clicked on Sergei Rachmaninov, and on the succeeding screen clicked on the title, “Rhapsody on a Theme by Paganini.” I clicked on Rachmaninov as the artist and Leopold Stokowski as the conductor. I ignored the multi-volume sets and clicked on the single recording (it’s actually a 2 CD set), and there was the cover of the album. I was ready to order it by putting it in my cart. If you can’t find what you want, you can e-mail ArkivMusic from the home page and describe the recording you want. Give as much detail as you can. Within 24 hours ArkivMusic will reply, telling you how to find it if they have it — as they probably do. Experiment by looking up various records that you want, and enjoy!